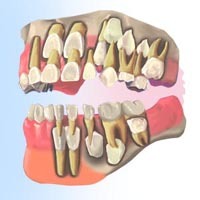 The first permanent molars usually erupt between ages five and six, so they are sometimes called the six-year molars. Because the six-year molars do not replace any primary teeth they are often mistaken for primary teeth. You should remember that they are permanent teeth and must be cared for properly if they are to last throughout your child's lifetime. These molars are especially important because they determine the shape of the lower part of the face. They also affect the position and health of the other permanent teeth. Your dentist may recommend that your child use an over-the-counter fluoride mouthrinse daily after age six. Be sure to instruct and, if necessary, supervise your child in the use of these mouthrinses. By age 7, your child should be able to brush alone. Flossing, however, is a more difficult skill to master. At about age 8, the child should be able to floss his or her own teeth under your supervision. When teeth are developing, depressions and groves form in the chewing surfaces of the enamel. These features are called "pits and fissures". They are impossible to keep clean, because the bristles of a toothbrush cannot reach into them. 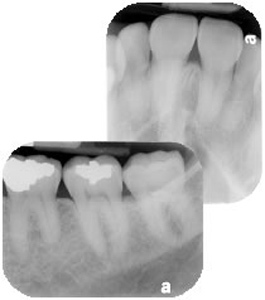 Therefore, pits and fissures are ideal places for plaque and bits of food to become lodged. Placing a thin covering (a sealant) over the pits and fissures can reduce the risk of decay. For more information on Sealants Please Click Here. Dental X-rays are extremely valuable for helping to detect oral diseases of the teeth and surrounding tissues. An X-ray exam may reveal small cavities that can't be seen by a visual exam, infections in the bone, abscesses, cysts, developmental abnormalities, such as extra or impacted teeth and some types of tumors. Just because such diseases, including early tooth decay, can't be seen by a visual exam does not mean that treatment isn't required. Yes. Numerous precautions and advances in X-ray equipment help protect patients from receiving unnecessary radiation. The amount of radiation received from a dental exam is extremely small compared to other naturally occurring sources of radiation, including minerals in the soil, radon, and cosmic radiation from outer space. A full-mouth series of films, using state-of-the-art technology, will deliver an effective dose that is equivalent to about 19 days of exposure to naturally occurring environmental radiation. This depends upon the patients individual health needs. If you are a new patient, the dentist may recommend X-rays to determine the current status of your mouth and to check for hidden problems. The need for radiographs varies according to your age, risk for disease, and your past dental history. The most effective way for your child to get fluorides protection is by drinking water containing the right amount of the mineral... about one part fluoride per million parts water. This is of special benefit to children, because fluoride is incorporated into enamel as teeth form. Children who, from birth, drink water-containing fluoride have up to 40% fewer cavities. Many of them remain cavity-free through their teens. Even though your regular water supply may be fluoride products such as toothpaste, and in some cases, mouthrinses. You may want to discuss with your dentist any special fluoride needs your child may have. Fluoride toothpastes and over-the-counter fluoride mouth rinses that carry the ADA seal have proven safe and effective. - Brushing with a pea-sized amount of fluoride toothpaste. With your help, in combination with their own efforts and regular professional care, your daughters and sons can grow up cavity-free and keep their teeth all their lives. - Make sure your child gets the fluoride needed for decay-resistant teeth. Ask your dentist how this should be done. - Brush and floss your child's teeth daily until the child can be taught to do this alone. Then encourage him or her to brush and floss. - Take your child to see the dentist regularly, beginning at six months of age. - Put only water in your child's nap time or bedtime bottle. - Start cleaning your child's mouth daily. - Start brushing as soon as the first tooth erupts.